This technical note will show you how to review and tag together all the documents identified as near duplicates, speeding your document review. Step 2. 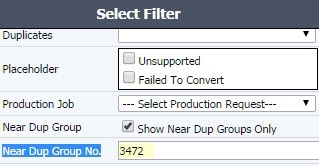 If you want to narrow down the results and show only one specific Near Dup Group, you can also apply filters by 'Near Dup Group No. ', for example 3472. Open the Browse page, go to the 'Fields>Show Fields' section and select the following headers: Date, Pages, Words, Responsiveness, Privilege, Work-Product & Confidentiality. Step 5: Filter on 'Group' = each of the groups to review and code one at a time (Filter>Select Filter>Group). If the documents in a group are sufficiently similar for mass tagging, then select all in a group and apply Multi-Doc edit for the tags of Responsive, Privilege, WP, Confidentiality, etc., as appropriate. The same can be done with Custom Doc Fields.